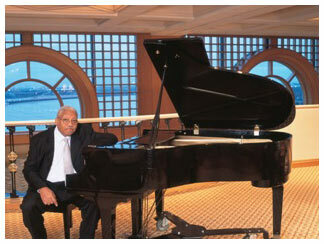 Celebrated jazz patriarch and Loyola alumnus Ellis Marsalis M.M.E. ’86, H '07, will lead an ensemble of jazz students in a rousing program of classic jazz standards and iconic original compositions on Thursday, March 21 at 7:30 p.m. at the Old U.S. Mint, located at 400 Esplanade Avenue in New Orleans. Tickets are $10 for general admission, $5 for Loyola faculty and staff, and free for Loyola students. Tickets are available online at www.montage.loyno.edu or by calling 504-865-2074. Cash-only sales will be available at the door 30 minutes prior to the performance. Marsalis is widely known as an accomplished jazz pianist and instructor and is often credited with shaping some of the genre's most important new musicians. He was a figurehead of the jazz music revival in New Orleans in the late 1950s and early 1960s and has enjoyed a career spanning almost four decades. After years of success playing in New Orleans clubs, Marsalis won nationwide recognition in the 1980s and 1990s when appreciation for his teaching skills led to numerous national recordings. In January 2011, Marsalis became the first jazz artist in history to release an interactive album, “Ellis Marsalis: An Open Letter to Thelonious,” in the new iTunes LP format. That same month, the National Endowment for the Arts honored him as a 2011 Jazz Master.